Callaway, a fourth-round pick in the 2018 NFL Draft, was cited for marijuana possession and driving with a suspended license when he was stopped early Sunday morning in Strongsville, Ohio. "The case is under investigation," a spokesman for the Strongsville Police Dept. told Cleveland.com on Tuesday, while declining further comment. [post_ads]Callaway had a turbulent career at the University of Florida that caused him to tumble in the draft. His arrest came hours before Cleveland traded wide receiver Corey Coleman to the Buffalo Bills on Sunday. 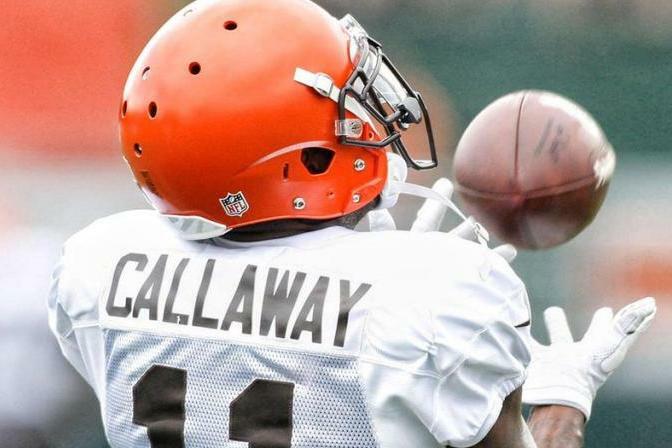 On Monday, Callaway was elevated to the first-team unit in place of Coleman, the No. 15 overall pick of the Browns in the 2016 NFL Draft. "We are aware of the citation [and] are in the process of gathering more information and will comment further at the appropriate time," the Browns said in a statement Tuesday afternoon. Cleveland head coach Hue Jackson told reporters that he was not aware of the incident until Tuesday. "We are going to do anything and everything that we can to assist him off the field first to make sure that is right, and that we have no tolerance for things that are not becoming of the Cleveland Browns," said Jackson. According to the police report, Callaway was arrested at 2:59 a.m. Sunday morning. He had been stopped for a traffic violation after failing to yield to oncoming traffic. After police determined Callaway was driving with a suspended license, an officer detected "a small amount of suspected marijuana." Callaway is due in court Thursday morning. Cleveland traded up in the fourth round to take Callaway, who was suspended twice at Florida and missed the entire 2017 season for allegedly using stolen credit card information to fund bookstore accounts. At the NFL Combine, Callaway tested positive for drugs, and in 2016 he was cleared of sexual assault allegations. Because of a diluted urine sample at the Combine, Callaway already is in at least Stage 1 of the NFL's Substance Abuse Program, Cleveland.com reported. "The matter will be reviewed under the NFL-NFLPA substances of abuse policy," NFL spokesman Brian McCarthy told the website in an email. Despite his troubles, Callaway did produce on the field. He recorded 89 receptions for 1,399 yards and seven touchdowns while starting 24 of 26 games for the Gators.